With them going up earlier and earlier every year, London's Christmas lights and decorations extend the magical festive period. From traditional and classy to quirky and in-your-face, they illuminate much of central London and are an essential part of Christmas in London. 750,000 LED lightbulbs illuminate the capital's most famous street. Despite sticking with the same display as last year (a huge overhaul was planned to mark the arrival of Crossrail but delays with the project meant the plan was aborted), Oxford Street is still a headline act on London's Christmas lights line-up with 750,000 LED lightbulbs illuminating the capital's most famous street. The night the lights are switched on sees a new series of in-store gigs by emerging artists. Capital XTRA presenters Yinka Bokinni and Robert Bruce DJ and introduce performances from 21-year-old singer Kara Marni, 2018 Mercury Prize nominee Novelist, R&B powerhouse Kara Marni, and singer-songwriters Ray BLK and Isaac Waddington. Over 90 Oxford Street stores are joining the 6th November celebrations, offering discounts, giveaways and special events. The nine piece New York Brass Band plays on the roof at John Lewis' Skyline Skating, ASICS is hosting a light up run, complete with UV face painting and glow sticks, and Debenhams is giving away 1,000 scratch cards. A festive light installation at the sparkling new Heatherwick Studio-designed district in King's Cross. A special festive light installation brightens winter nights at Coal Drops Yard, the new Heatherwick Studio-designed shopping district in King's Cross. The giant sculptural lights which respond to the industrial structures of their location form Spaces Frames, an installation in and around Coal Drops Yard and Granary Square, in situ from 6th November 2018 until 6th January 2019. The light boxes, shaped into archways, circles, semi-circles, ovals and straight lines, act as beacons, drawing visitors towards and beneath them. Designed by Studio Mieke Meijer, the domestic version of the Space Frames can be seen at - and commissioned from - MDR Gallery on Lower Stable Street, Coal Drops Yard. Neon lights spelling out lyrics from famous Queen songs welcome you to Carnaby Street. This year's Carnaby Street Christmas Lights take the lyrics from famous songs by rock band Queen and puts them up in neon writing over the famous London shopping street. They're adding Christmas spirit to the Bohemian Rhapsody Light Installation, unveiled in October and switched on by Brian May and Roger Taylor. The Christmas reveal takes place on Thursday 8th November 2018 this year and sees over 100 fashion brands, restaurants and bars throughout the 14 streets of Carnaby offer discounts and special in-store events. Tickets are free but you must register online in advance. As well as the discounts there are DJs, live music, complimentary food and drinks, a pop-up bar and plenty of street entertainment. New lights are installed for 2018 in this picturesque area known for its festive lighting extravaganzas. The covered market at Covent Garden and the surrounding area is filled with 115,000 lights, a 55 foot Christmas tree, decorated with over 30,000 lights, and new light installations for 2018. Celebrations start with the Christmas lights 'switch on' on Tuesday 13th November led by The Kingdom Choir who performed at the Royal Wedding of Prince Harry and Meghan in May. The festivities continue with 'Black Tie Day' (a stylish twist on Black Friday), just one of a series of late night shopping events which continue on Thursday 6th, 13th and 20th December. New for 2018 is an 'infinity chamber' light installation in Conduit Court - find it on Floral Street, home to Paul Smith and The Shop at Bluebird. The magnificent reindeer statue on the East Piazza returns to this picturesque area known for its festive lighting extravaganzas. Six weeks of sparkling lights and 24 immersive Merry Marylebone Moments. 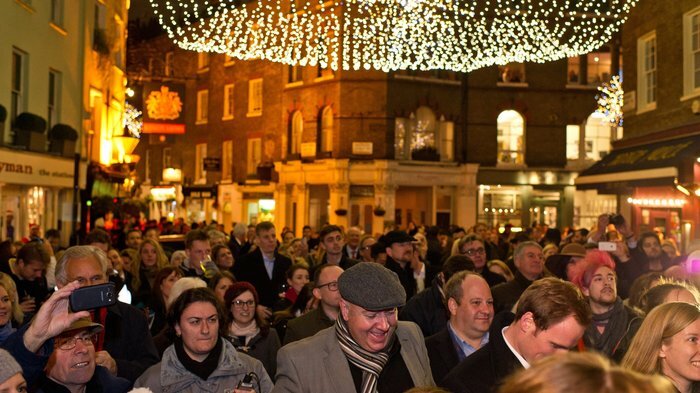 The Christmas Lights shine over Marylebone High Street from Wednesday 14th November, with live bands and fun fair rides adding to the festivities on the first night. Up to 10,000 people are expected to attend the event, which also includes live music performances on the main stage on Devonshire Street by children from local schools, professional solo artists and musical groups directed by Tony Moore. They usually get a starry celebrity to switch on the lights - previous years have seen the likes of Jennifer Saunders, Sophie Dahl and Barbara Windsor do the honours. In the six weeks leading up to Christmas, shops in Marylebone - which has a wonderful village atmosphere - are offering 24 immersive 'Merry Marylebone Moments', treating shoppers to exclusive in-store discounts and promotions, talks, workshops and seasonal drinks on winter terraces. The regal sweep of John Nash's famous shopping street has a great, festive atmosphere when the Christmas lights are switched on. Regent Street goes traffic-free for the official turning on of the lights and the Spirit of Christmas Theme returns, with a fleet of spectacular large-scale 'spirits' with widespread wings soaring over the street. The display, designed by leading British lighting creatives, James Glancy Design, takes inspiration from the street's original lights display back in 1954 and features over 300,000 twinkling lights, making it the biggest display in the capital. Lighting up Duke of York Square, Pavilion Road, Sloane Street and King's Road. Free horse and carriage rides, wreath-making classes, chestnut roasting and festive activities take place as the Chelsea Christmas Lights are switched on, lighting up Duke of York Square, Pavilion Road, Sloane Street and King's Road. From 2pm on Saturday 17th November, Santa and friends are joined by real reindeer on Duke of York Square. There'll be carol singers and performers across the neighbourhood before the lights are officially switched on at 5pm. In addition, on Saturday 1st December, Chelsea hosts a special shopping event with restaurants and bars offering exclusive offers, treats and surprises. Duke of York Square hosts a special festive edition of its gourmet market and Father Christmas can be spotted around the area while entertainment is laid on from Pavilion Road to Duke of York Square and Sloane Street. Over 40 stores across St James's stay open late on Thursday 15th November. The dramatic, large scale spirits that form a canopy of lights over Regent Street extend throughout St James's, from Jermyn Street to St James's Market. To mark the moment they're switched on, on Thursday 15th November, there's a late night shopping evening, with a live choir in St James's Market from 5pm to get you in the festive mood. Over 40 stores across St James's stay open late on the night and there's Christmas themed street entertainment on Jermyn Street, including hot chocolate and churros stations as well as festive music and performers. In-store events and special menus in restaurants across St James's are all part of the fun. Larger-than-life animal sculptures and glowing fountains at the penguin pool house. A canopy of over 100,000 glistening pea-lights and larger-than-life animal sculptures are part of Christmas at London Zoo - don't worry, all the real animals are tucked up in bed. A mile-long path scattered with twinkling lights and festive sounds takes you through tunnels of light and pea-lit wild animal sculptures as the illuminated trail is set up for the first time, created in partnership with the team behind Christmas at Kew. Walk beneath playful ribbons of colour-changing lights and listen for the voices of singing trees. Discover the glowing fountains at the famous penguin pool house where the light show changes in time to a soundtrack of much-loved Christmas classics. Oh and keep an eye out for Father Christmas and his elves along the way. A Cathedral of Light, fire garden and 300 glowing origami boats light up Kew. A chorus of singing trees, giant light-up piano keys connected to a real-life piano and laser beams over water await visitors to the mile-long illuminated trail that forms the centrepiece of Christmas at Kew. After dusk, Kew Gardens is lit up by giant light sculptures, a fire garden, hundreds of shining petals, gigantic flower pots and light projections on the Palm House. Each year they add different light installations so even if you've been before - and it has become an annual tradition for many Londoners - there's something new to see. You can also stop off to see Santa and his elves performing panto along the route, enjoy carousel and helter skelter rides as well as mulled wine, mince pies and traditional festive fare. If you want to sit down to a traditional Christmas dinner you can do so at Kew's Botanical restaurant. The magical walking tour returns for another year. The beautiful oaks trees and gardens at Syon Park are illuminated in spectacular fashion once again this winter. Adding a significant veil of mystique to the festive season, the magical event invites visitors to enjoy a unique guided walk. The trail leads you around the 18th century lake - where the shapes and textures of the ancient winter trees are reflected in the water - and past intriguing corners of the estate, all of it floodlit to maximum rainbow effect. The shadows and magic of a frosty winter's night make this an ideal opportunity for photographing the forest in a unique way. Warm clothing and stout footwear are advised and hot refreshments are available on the night. Live music, dancers, street performers and carol singers help to turn on the lights. The Christmas Lights go on over the picturesque Shepherd Market in Mayfair on Thursday 6th December when there will be a host of entertainment including live music, dancers, street performers and carol singers. The surrounding boutiques, brasseries and pubs that make this one of London's 'hidden gems' will be staying open late for a night of mulled wine, mince pies and merry making. Little people haven't been left out - there's fun for children with a treasure hunt and Santa's photo booth where they will have their Christmas wish granted. They usually get a bone fide celebrity to turn on the lights - Elizabeth Hurley and John Cleese have had the honour in recent years. The glorious Norwegian Christmas Tree has been a gift from the people of Oslo since 1947. Since 1947, stately Trafalgar Square receives a majestic Norwegian Christmas Tree as an annual gift from the people of Oslo, thanking Britain for its support and friendship during World War Two. The enormous tree is a popular seasonal tourist attraction, particularly in the fortnight leading up to Christmas, when each evening (from 4pm to 8pm on weekdays, and from 2pm to 6pm at weekends) a different choir gathers there to sing carols and raise money for a range of voluntary or charitable organisations. Passers-by are welcome to come and listen to the carols in the square and join in the festive cheer. Nelson's Column is decorated with Norwegian white lights and the tree is illuminated from noon until midnight until the Twelfth Night of Christmas in early January. A few days after the official lighting of the tree there's a torch-lit procession on the steps of St Martin-in-the-Fields, as the choir and clergy bless the Crib in a special ceremony in Trafalgar Square. The tree actually goes up in late November if you want to see it in all its naked evergreen glory. From cheap budget accommodation to luxury 5 star hotels see our special offers for hotels, including Amba Hotel Charing Cross from 39% off.